Life is full of interesting views, and you need a lens that can catch them all. Whether you're shooting wide group photos or portraits, close-ups or landscapes, photos or HD videos, the AF-S DX NIKKOR 18-55mm f/3.5-5.6G VR II delivers the sharpest, most colour-rich results imaginable. Optimized for Nikon's new high-resolution DX-format image sensors, it borrows the ultra-compact retractable lens barrel design from the Nikon 1 system. Nikon's remarkable Vibration Reduction technology provides 4.0 stops* of blur-free handheld shooting—enjoy crisp, clear images even if your hands are a bit unsteady and shoot at slower shutter speeds in low-light situations. No matter where you're headed, grab the AF-S DX NIKKOR 18-55mm f/3.5-5.6G VR II and rest assured: you'll be able to land fantastic shots. 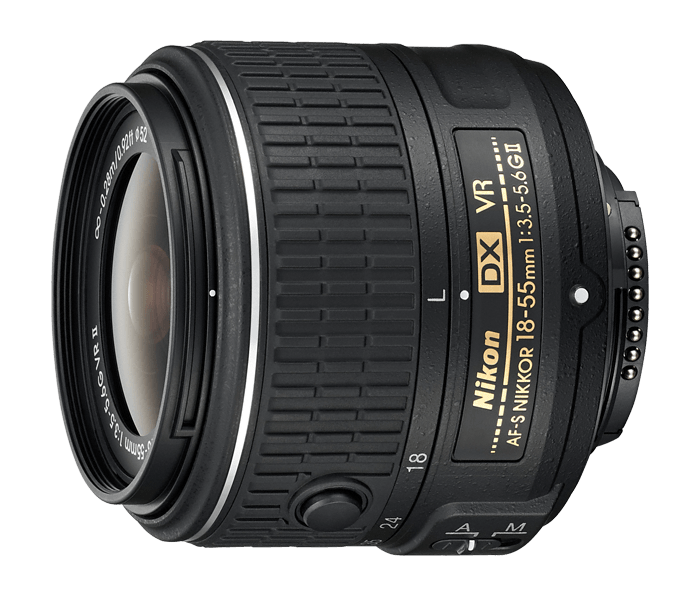 The AF-S DX NIKKOR 18-55mm f/3.5-5.6G VR II is optimized to draw maximum performance from Nikon's new generation of high-resolution DX-format HD-SLRs. Nikon's Super Integrated Coating (SIC) ensures outstanding colour richness and contrast by reducing reflections and glare. A seven-blade rounded diaphragm renders backgrounds and out-of-focus elements in your shots with a natural, softly blurred appearance. Your photos and HD videos will reveal the astounding sharpness and detail your HD-SLR is capable of achieving.